Here is a list of planned and past public presentations. Sign up for the newsletter to be alerted when a new presentation is planned. There are currently no public presentations scheduled. Andrew Lock is the first and only Australian to summit all 14 of the world’s 8000m peaks. 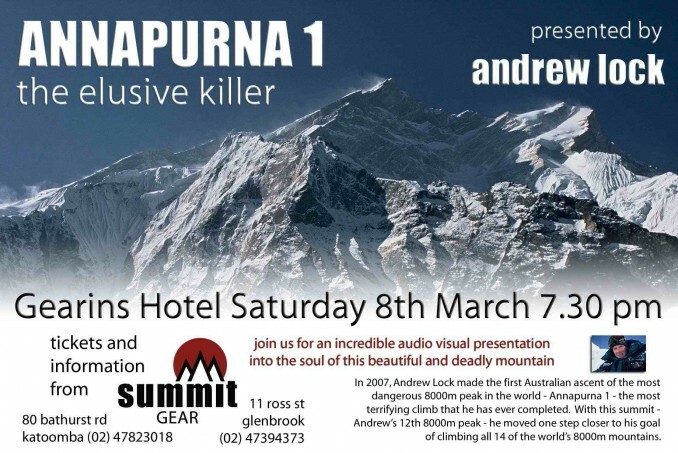 To celebrate the release of his thrilling new book SUMMIT 8000, Andrew will share a gripping account of his death-defying ascents at venues around Australia. Don’t miss your chance to meet Andrew and be inspired by his victories, the near-misses and the great tragedies. The intense human drama of the expeditions infuses the book and his presentations—sometimes funny, sometimes fierce and always fascinating stories about climbing rivalries and mountaineering politics. 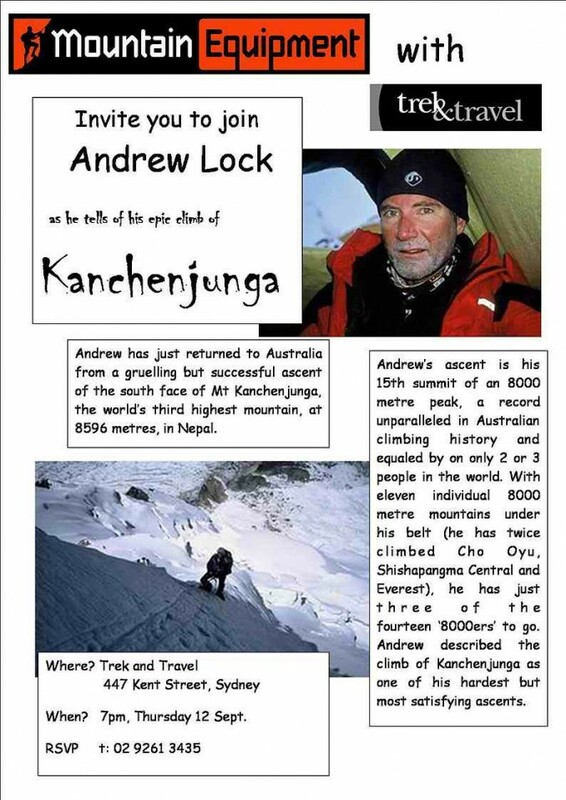 The remote and stunning landscapes and cultures which Andrew encounters on his journeys add rich texture to his tale. Ultimately, you will learn ‘why does he do it?’ Why does anyone take on such a challenge, knowing that they will likely die? You cannot help to be inspired by the achievements of just one man. 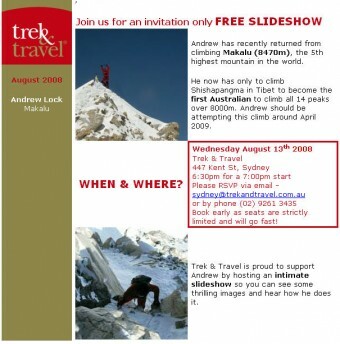 Andrew has lived more adventure, hardship, near death and exhilarating life experiences than most people can ever imagine. Hearing his tales of climbing the world’s biggest mountains will arouse your inner adventurer to challenge your own perception of what you are capable of as an individual. 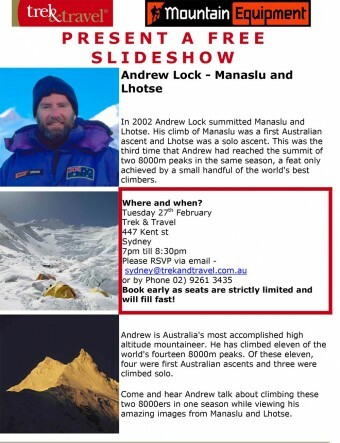 Andrew’s presentations have been known to sell out in advance so be sure to get there early! 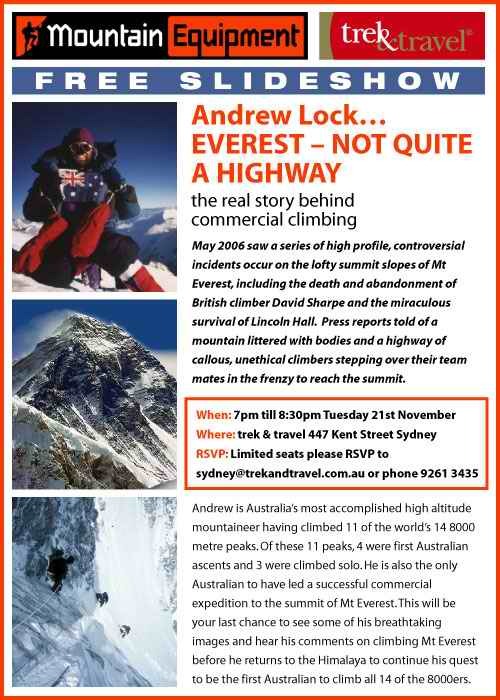 Andrew Lock: ‘Summit 8000’ The Tour Tickets: $20 & $10. Presentation will start at 7pm , with book signings from 6pm. Andrew’s new book Summit 8000 will be available for purchase and signing at the venue. Wagga Wagga Wed 3 June 15 Romano’s Hotel, cnr Sturt and Fitzmaurice Sts.